We're turning the corner on this A-Train into episode #100 of our original content show, and boy do we have some surprises in store for you! We've got some special friends coming on the show that have made our first 100 episodes what they are. We thought about inviting you guys on, but some of our guests...kind of just barged in through the door, barking...so we ran out of time. Sorry! 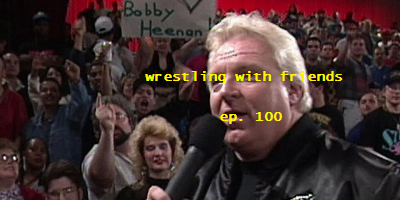 We're also heading back to Heenan's Hall to celebrate #100 the right way, by enshrining some of wrestling's greatest moments of all time. Unfortunately, this episode was not eligible...yet!